Eric Cantona has hit the headlines again for all the wrong reasons as he was involved in an altercation with a photographer in London. Cantona was having a drink with a companion in Camden at a The Queens bar when the photographer approached to take some snaps. That is when things got a bit heated as Cantona did not appreciate the attention and let the photographer know in no uncertain terms that he needed to leave by lashing out. Mr Cantona's companion then went inside the bar and waited for things to calm down. 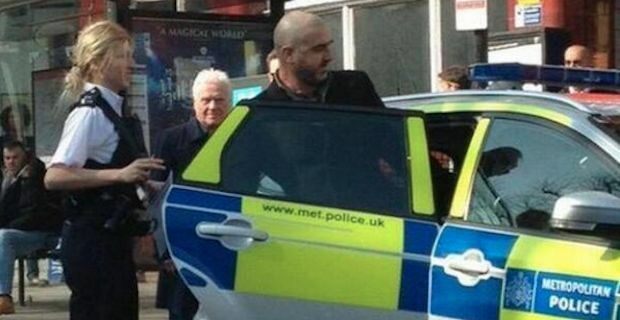 Police were called and Cantona was seen vigorously explaining himself to a police officer on the street. He was then placed in a police car before being taken to a police station and was later released with a caution. The former Manchester United and France star is well known for having a short temper. Cantona was infamously banned for kung fu kicking Crystal Palace "fan" Matthew Simmons after being sent off in 1995. Simmons had sprinted down to the sideline to hurl abuse at Cantona and he definitely got a reaction he wasn't expecting. Cantona continues to work these days in a dual role as a movie actor and as director of football with MLS franchise the New York Cosmos.